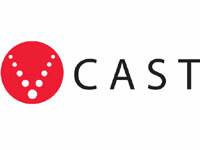 Today marks the launch of Verizon Wireless' V CAST media streaming service, the first of its kind in the United States. V CAST uses EV-DO to download the content. V CAST is available to Verizon Wireless subscribers with capable phones for an additional $15 per month. That fee includes unlimited access to more than 300 daily updated video clips from news, sports, weather and entertainment content providers. Three new phones are being launched for the service, the LG VX8000, Samsung a890 and the UTStarcom CDM8940. Warner Music Group (WMG) announced today the launch of the nation's first mobile music video download service on V CAST. WMG is the first major music company to make its music video catalog of new stars and legendary artists available for download to consumers in the U.S. on their wireless phones. VCAST customers can enjoy a rotating catalog of music videos from some of the hottest WMG artists. The music video catalog will be updated once a week. All V CAST content is located in the Get It Now virtual store. Video clips will be refereshed daily throughout the day and will be between 30 seconds and three minutes in length. 3D games are avilable in the getGAMES aisle. Customers can access WMG music videos in the getVIDEO shopping aisle. Once in the getVIDEO shopping aisle, customers simply scroll to the Entertainment category and click on Music Videos to download WMG music videos.